What mistakes do people make today with regard to the land? Unsound agricultural practices continue. So do unsound logging practices, strip mining, overgrazing, the use of agrochemicals and pesticides, high water consumption, destruction of rain forests, over consumption of non-renewable resources. Students can branch out into issues of ecology and stewardship of the earth. Look into local ecology groups who can link your class with special hands-on projects. But looking a pictures give one a better, deeper and scarier appreciation of what we need to avoid repeating. There are reasons to be scared. 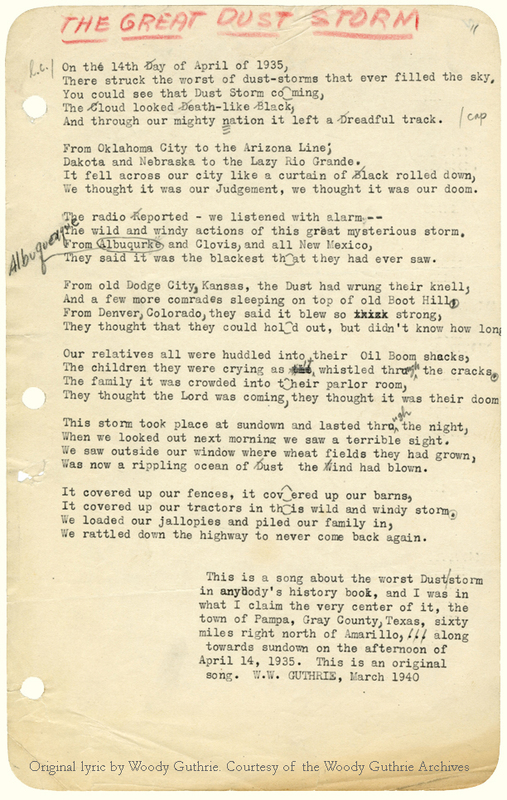 Another great Dust Bowl song "My Oklahoma Home". Hugh Hammond Bennett: remind you of any current attitudes towards expert scientists? Take note of Brink's account of what Bennett had to resort to, to persuade legislators to stop dicking around and take the Dust Bowl seriously. It could be said that Bennett saved America. wow, so let me get this straight, there can be extreme weather events even when co2 is below the assumed 350ppm safe level? Also, what computer model or activist assumed that this is the safe level, since you know, its below earth's average? wow you must be so pissed off that Steve McIntyre caught a freshly picked cherry in the latest bogus fake warming report coming out of Australia. It's been a tough few weeks for the gang here, as evidenced by the fact that they are carefully avoiding the latest UVA developments and the Australia developments. Not to mention the chemist who was fired from Oregon for basically listing scientists who don't believe in global warming. Seriously, go look at his slide show, the majority of the slides are a list of scientists. ~524BCE The 50,000 strong army of Cambyses II supposedly buried by a sandstorm en route to the Siwa Oasis. what did the people do wrong in 524BCE, does anybody know? you know what this isn't even fun for me anymore, you're all a bunch of amateurs. I have a compendium of weather events from 0-1900A.D with which I can casually own each of you with individually. This is it for Dr. Cadbury for awhile at Rabett Run, authors are resorting to bottom of the barrel, easily smashed spins. Where would we be without breathless delegates to cry the latest faux-scandals from the outlying provinces? So Steve is on another earwig hunt? Yawn. When is he not? A paper withdrawn before publication for revision is hardly earth-shattering, unless you want to talk it up. Plenty willing to do so, apparently. Some guy got let go from OSU because his contract expired. So it goes. Happening to a lot of good academics these days of tight budgets. But he's a science denier, and special. Apparently he made slides from that crock of shyte "The Great Global Warming Swindle". Exactly the man to teach your kids and lead America to the next generation of technological leadership. So let's have an internet campaign to have him re-hired before thousands of others more deserving. I note the President of UVA has resigned, but whether forced out by or not, we do not know, nor by whom. Wow, did Jaybird just flounce? The real question, will he stick the flounce. Hey, either way, it's a win. If he comes back we ridicule him like the ridiculous little turd he is. If he doesn't, we don't have to read his particular brand of weapons-grade stupid anymore. Pass the Cohibos! "The witness was not cheerful, but he was persistent, informed, and courageous. He told a grim story. He had been telling it all morning. Chapter by chapter, he annotated each dismal page with facts and figures from a reconnaissance he had just completed. . . . The witness did not hurry. He did not want to hurry. That extra ace he needed was not yet at hand. Well he realized that the hearing was beginning to drag. Out of one corner of his eye, he noted the polite stifling of a yawn, but Hugh Bennett continued deliberatively. . . . Bennett knew that a dust storm was on its way. He had newspaper items and weather reports to support this knowledge. But it seemed mighty slow arriving. If his delaying tactics were successful, the presence of the swirling dust—material evidence of what he was talking about—ought to serve as a clincher for his argument. Presently one of the senators remarked—off the record—'It is getting dark. Perhaps a rainstorm is brewing.' Another ventured, 'Maybe its dust.' 'I think you are correct,' Bennett agreed. 'Senator, it does look like dust.' The group gathered at a window. The dust storm for which Hugh Bennett had been waiting rolled in like a vast steel-town pall, thick and repulsive. The skies took on a copper color. The sun went into hiding. The air became heavy with grit. Government's most spectacular showman had laid the stage well. All day, step by step, he had built his drama, paced it slowly, risked possible failure with his interminable reports, while he prayed for Nature to hurry up a proper denouement. For once, Nature cooperated generously."